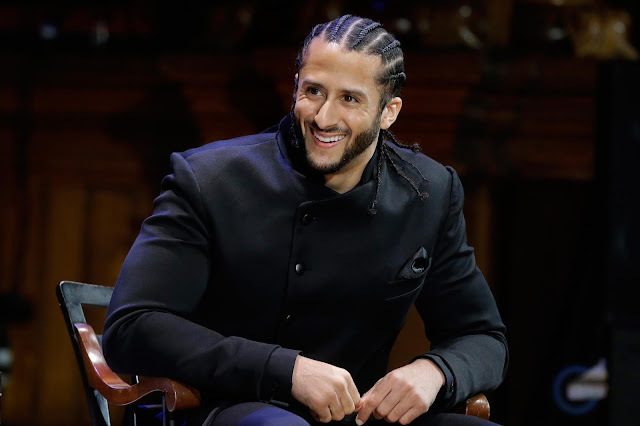 Former San Francisco 49ers quarterback Colin Kaepernick on Thursday received Harvard University's most prestigious black history award. Kaepernick, who was the first NFL player to demonstrate against racial inequality by kneeling during the national anthem, received the W.E.B. DuBois award alongside seven other African-American public figures at a Harvard ceremony. He urged others to further protest racial inequality and police brutality to help improve the lives of African Americans across the country. "I feel like it's not only my responsibility, but all of our responsibilities as people that are in positions of privilege, in positions of power, to continue to fight for them and uplift them, empower them. Because if we don't, we become complicit in the problem," he said. "It is our duty to fight for them and we are going to continue to fight for them." Activist Cornel West introduced Kaepernick and compared his protest to those of famous boxer Muhammad Ali. “We don’t have anybody who comes close to the Muhammad Ali of athletics, to give up millions and millions and millions and millions of dollars…It’s not the number, it’s the integrity, rather than the popularity," he said.